After a lot of trouble with the new page format it's great to see the video and hear the commentary. And Bolton kicks off Masters Qualifying! Two runs apiece and the best time counts. 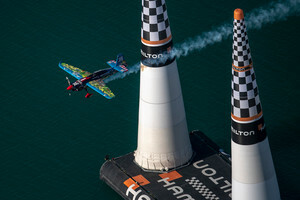 Bolton took 53.164 in Free Practice, a great time and a new and competitive spirit from the Chilean pilot for 2019. He's looking good but a little soft on the VTM, he's got the new rules and regs in the back of his mind and not quick as attacking as Free Practice, but it's a solid performance so far... great flying and nice rhythm there. Just under review but it's all clear and Bolton goes clear with 54.228 for his first run. A great first effort but can he find a little more time in the track? Let's see. Into the track at 198kts... he's looking good at 10.2G in the VTM and he's through the first big obstacle cleanly and carefully... he's flying against himself here essentially... we're not seeing so much aggression as he might in the VTMs but the pace is there despite a conservative performance. But understandable given his stance as the first pilot out in the track today and a great start to the season for the Chilean. Steady start for Kopfstein, who has finished in 9th place in two Free Practice sessions this week. Kopfstein was plagued by 9th place finishes last year so he'll want to move up the timesheets today... a little hard and a great pace from his Edge... Kopfstein pulling hard through those VTMs BUT it's disciplined and clean. Kopfstein knows he can claw back some time and will surely go a little more aggressively in this second run. Can he go better than 54.529? Through the Start Gate at 200kts exactly, and we're seeing green in the splits as he goes just ahead by 0.015s... he's pulling hard through the chicane and the second VTM is looking a little on the slower side again as he loses time coming out of the top there... full throttle to the Finish Gate but he can't catch Bolton and takes 2nd place overall despite a faster second run. Former World Champion Matthias Dolderer up next. Dolderer looking to have a change of tactics here and perhaps lacking in the VTM to avoid any kind of penalty... but he's lost time there despite a strong start and Dolderer is now chasing Bolton. He played it safe and it's not working out... no penalties on the board and more pace in that final section but he's got work to do as he takes 3rd place overall so far with 54.593, and another run to bank in. Dolderer is cleared into the track for his second run. Into the track at 198kts and he looks really quick through the chicane and goes straight for the VTM... it's a better performance and he's looking a tiny bit rattled perhaps as he tries to maintain precision and pace in the track... the second VTM is MUCH better and a great time for Dolderer who is set to take the top spot... but he picks up +1s for Over G... but despite the penalty he's got the top spot and that shows just how much time he's found in the track! Le Vot into the track next. 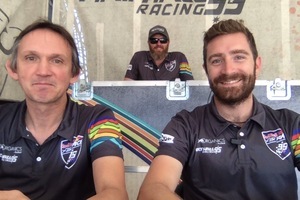 Le Vot finished in 7th and 10th in Free Practice... he's looking relaxed and comfortable out there and he may have heard about Dolderer's time and penalty and knows what he's got to do. He takes a different approach to the VTM and Le Vot has it all in hand... he's showing some textbook flying here and the splits agree... green for Le Vot, and just a little slip off the pace there in the final section, and he's got a great run in the bag. Le Vot takes the top spot with 54.177 but he's got another chance to go faster and put in an even more competitive time. Wow, first big VTM we've seen in the session from Le Vot. That is the risky line for sure. Well done FLV! Congrats François.. great strategy !! Le Vot into the track at 199kts... the splits in the first section are flip-flopping from red to green to red again. 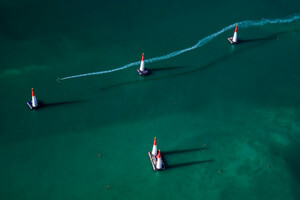 He's racing himself here but he knows he's got to be really fast to retain his spot in the top half of the timesheets. No penalties and a little more aggression from Le Vot. He's done a great job and his tactics are a little risky but in these flying conditions they seem to be working for the Frenchman right now. 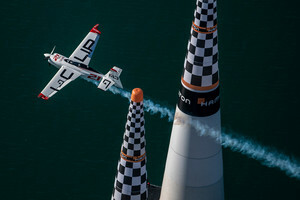 Nicolas Ivanoff cleared into the track by Jim DiMatteo. Ivanoff into the track again and it's looking better for the French pilot. Still a lot of work to do though as the splits remain red... Ivanoff needs to tidy up those lines otherwise he's going to struggle to be competitive in the head to head heats tomorrow. Through the VTMs cleanly, no penalties this time but no movement on the timesheets. Ivanoff remains in 5th overall. Results could be all-change... stay tuned. And remember - 3 points up for grabs for the Qualifying winner. 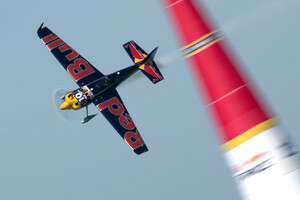 Hello Red Bull Air Race Team, hello fans around the world! Finally, the 2019 season is here! Have a nice season everyone. May the best pilot win. Smoke On! :D Greetings from Poland! Well done Juan! But we HATE that plane...can anyone guess why? Velarde took the top spot in Free Practice and could finish in a strong position today... and he's looking so smooth and composed out there with a comfortable lead and the splits firmly in the green. 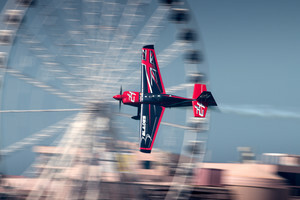 Velarde in perfect control out there, the right amount of aggression and fluidity in the raceplane, and smooth flying is turning into competitive pace out in the track. Velarde almost effortlessly slips into first place with 53.687 and straight into his second run, and the splits are again in the green with textbook flying. The second VTM is fast and he's gaining momentum through the track, over half a second faster than his previous first place time... but the buzzer goes and he picks up +2s for incorrect level flying at Gate 4. Without that penalty he would have been looking at 53.067 but his first result stands. McLeod next into the track and the Canadian has been a regular on the podium in Abu Dhabi, so will be looking to repeat history again in 2019. Into the track at 200kts and not long after +1s for Over G... that's extra baggage that he won't want to carry but it's not disastrous right now. McLeod is looking fast and composed and is for all intents and purposes faster than Velarde, but the lack of precision is costing him right now. McLeod clocks in at 54.468 including the +1s but luckily for McLeod there's another chance to improve. McLeod back into the track and the Canadian is flying on the EDGE as he pushes the limits through the Start Gate at 200.22kts... he's FAST and he's clean so far and the splits are GREEN GREEN GREEN, just 0.2s faster than Velarde in the first split. The VTM was composed and within limits, and he's looking more aggressive but crucially CONTROLLED... another solid VTM and McLeod is going full throttle through the Finish Gate and he's taken the top spot from Velarde with a clean run. More of the same tomorrow please! Matt Hall Racing pushing out to the grid in 2mins, via weighing scales. Wish us luck! Britain's Ben Murphy is now into the track with 200kts on the nose and a substantial start... a little bit of a stumble into the first VTM and he needs to push harder in those manoeuvres. Good pace but he's definitely playing it safe out there. Same story with the second VTM, well under the G-limit but it's not going to win him race heats. Murphy slips into 5th overall so far with 54.185 and we're back into the track for his second run. Murphy back in at 198kts... he knows he's got a solid run in the bag and now he's giving this run more pace and pushing his limits a little more... VTMs are more aggressive and we're seeing much more pace now, a good second ahead with a better result from Murphy as he goes under review. But it's all good and he's up to 3rd place overall so far with potential for an extra point to take forward tomorrow. Chambliss in next... 200.59kts and it's a perfect start but the VTM is just on the soft side, he needs to find about 0.25s as he passes through the first lap and back into the VTM... Chambliss is clean so far and he's got that lick of aggression that we're used to seeing... but under review for Chambliss and the buzzer goes... +2s for incorrect level flying at Gate 14. 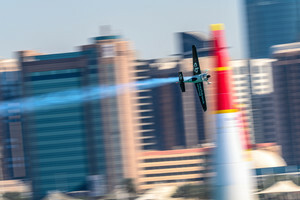 With that penalty Chambliss is in 9th place overall with 56.072 - he's only managed a best place of 5th in Free Practice - so more pressure to improve in his second run and avoid any more costly mistakes. Chambliss is 200kts and that's another great start for Chambliss and the VTM is smooth and on point... he's got some fantastic pace out there but we need to see PRECISION... and the second VTM is out of sorts and Chambliss has lost focus there... the buzzer goes in the second lap and that's another +1s on the clock for Chambliss, which will most likely result in a super-competitive heat tomorrow, as he moves up to 8th place overall. Muroya into the track at 198kts again and the first chicane is quick... into the first VTM and he's looking smooth and is really pushing against the ghost plane of Muroya. A little tuck in the track there and he's chasing down McLeod who seems to have more speed in the straights. Second VTM and Muroya is ahead as he dives down from the VTM and pushing hard hard hard, great control and laser focus right now in that last section... and he finally chases down McLeod to take first place overall so far. Textbook!